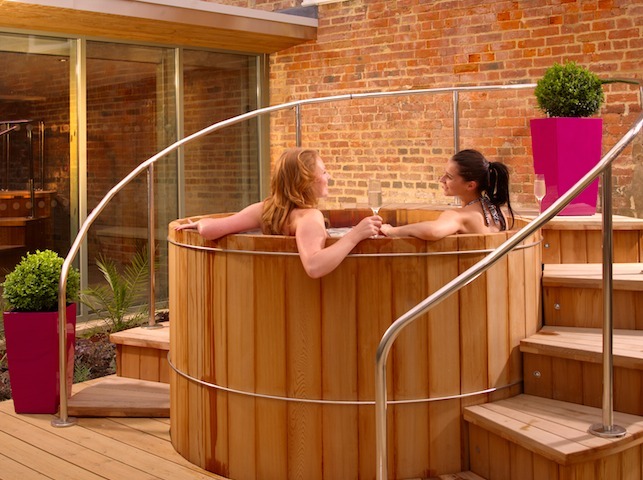 The Greenway Hotel and Spa is a stunning Elizabethan manor house hotel and spa. This amazing 21 bedroomed chic hotel is the most amazing place I have ever stayed, from staff, to facilities and food, it’s truly perfect. As you drive up the long drive you are treated to a glimpse of the magnificent building and once you’ve turned the corner into the ample carpark, you are stunned by the Cotswold stone exterior and the glow of warmth radiating from the windows. The beautifully manicured grounds and rustic garden pieces truly make this hotel feel like you have stepped into an elegant dream world. Even in winter this garden is inviting and an asset to the hotel. The most inviting scene and I couldn’t wait to start my stay. Greeted by Chris on concierge I was immediately booked in and shown up to my room, which was just gorgeous – truly spectacular. I had a double room with seating area and a luxurious bathroom filled with ESPA miniature products that far surpass your usual hotel toiletries. After the discovery of the toiletries I was amazed to see a jar of homemade biscuits amongst the array of tea and coffee making facilities. Chris informed me the biscuits were made daily by the kitchen and were replenished twice a day ….and they were! When I thought it couldn’t get better as I unpacked my bags, there was a knock at the door and I was given a glass of Champagne, definitely the best start to a spa weekend I’ve had! 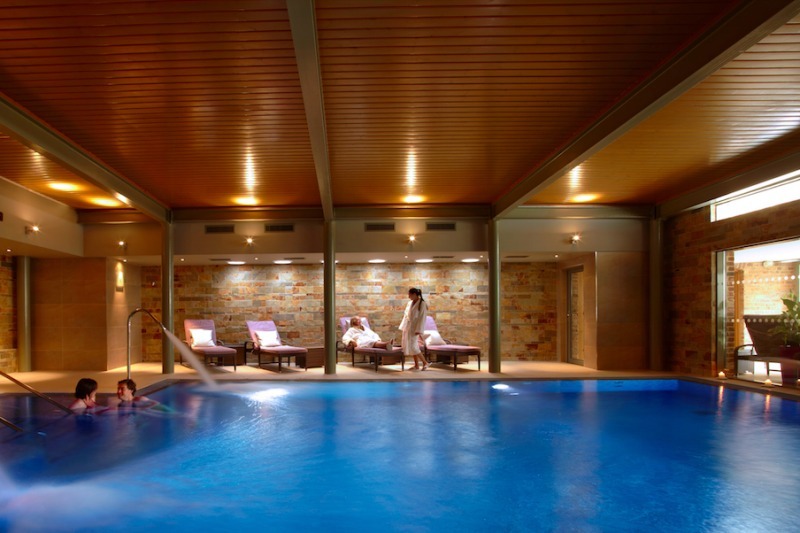 Slipping into my soft and luxurious dressing gown, I headed downstairs to the spa for a swim. As soon as I entered the spa area I was greeted by an amazing glow and smell of scented candles creating a gorgeous ambience. The spa ladies were warm and welcoming which made me feel instantly at ease in their environment. The Elan Spa with hydrotherapy pool, thermal suites, outdoor hot tub, Champagne nail bar and ESPA treatments were enough to make me want to return time and time again. Sitting outside in the hot tub with a glass of wine in the chilled winter air was simply bliss, not to mention the amazing outdoor roaring fire which just made the outdoor seating area look and smell like heaven. This is the perfect place to relax and read a book or sip a cocktail or two. The only thing to top this was being called for my ESPA treatment by Charlotte, who I highly recommend for a full body massage as she was amazing. After my amazing spa experience (one which I intended to fully repeat the following day) I headed for dinner. I sat in the bar for a pre-dinner drink where I was served with beautiful canapés – a tiny taster of the amazing cuisine to come from head chef Marcus McGuiness and his team. The Greenway Hotel and Spa is a 2 AA Rosette award winning restaurant so dinner was a highlight. On entering the dining room, I was warmly greeted by staff and their attention to detail was perfect. I can only say that the food was as fabulous as I expected and especially the beautifully presented marmalade soufflé expertly served by my waiter. This restaurant is truly the place for a special occasion and will create amazing memories. After a comfy night’s sleep the breakfast did not disappoint. Another beautifully laid dining room with stunning views of the countryside offered everything you could possibly want. There was a continental and cooked breakfast offered – both equally delicious. My intention was to venture into the local area with the information kindly supplied by the hotel but after enjoying the spa so much I stayed put all day to benefit from its relaxing ethos. I can honestly say this is a hotel and spa not to miss out on and the highest compliments to Dean (General Manager) whom will make sure your stay a wonderful experience along with all his amazing staff. The personal touch of a great experience was truly had. Take Your Dog to the The Tewkesbury Park Hotel – You’d be barking mad not to!